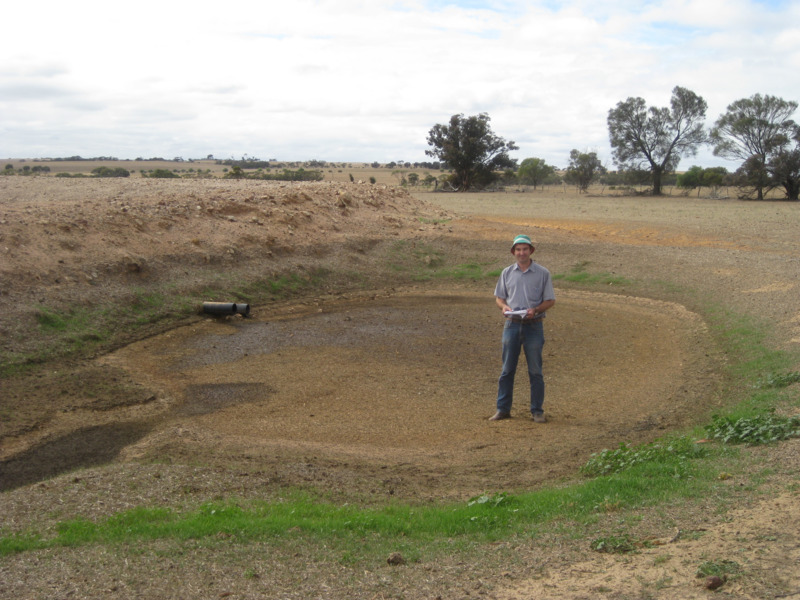 Silt washed into farm dams reduces dam storage volume, increases the chance of algal blooms and increases the proportion of water lost to evaporation. De-silting affected dams will reduce the likelihood of algal blooms, increase storage volume and prolong the life of the dam structure. This information applies to farm dams (excavated earth tanks) with a natural catchment or catchment banks. Farm dams with a well constructed roaded catchment rarely accumulate much debris or silt. Why de-silt a dry dam? Do you have a silt trap? If you do, then you can easily clean silt from the trap; if you don't, then the dam will gradually accumulate organic material and silt from the catchment. De-silting will increase the storage volume of a dam and remove the accumulated organic material and nutrients that may lead to algal growth when the dam fills. A dry dam provides an opportunity for machinery access that wouldn’t normally exist. While machinery is on-site, the overflow, dam seal or inlet can also be maintained. Cleaning out dams before any summer storms is a wise move because the opportunity may not come again for some time. You can use a bulldozer, scraper or excavator on a dry dam base to remove silt, taking care to not break the dam seal. Removing silt from a wet dam is complicated and can be dangerous and expensive. Dredging scoops or dredging pumps can be hard to find for farm use and we recommend that you contact specialist operators to do this job. There is an increased safety risk from using machinery in this situation and we recommend that relevant safety procedures are always used. Avoid environmental damage when de-silting dams. Silt, by its nature, is highly mobile in the landscape. Do not place recovered silt in or near drainage lines; there is an increased risk of the nutrient-rich silt washing back into the dam, or into the next dam downstream, or washing into rivers and wetlands to cause eutrophication. Spread silt with a particularly high nutrient content onto poor sandy soils. Using an elevated scraper is an efficient way of doing this. The cost of this operation could be offset by the 'claying' effect which reduces water repellence, increases water and nutrient holding capacity of the soil and reduces susceptibility to wind erosion. These factors together may give reasonable crop and pasture yield increases. Avoid spreading silt with a high salt content. Silt from a dam with high salinity water will have high levels of salt. Test the salt level of the silt and receiving paddock, and seek advice if the levels are high enough to reduce crop or pasture growth. Silt traps are an effective way of reducing silt moving into dams. Good groundcover in the upstream catchment combined with management of surface water will significantly reduce siltation in the trap and the dam. We recommend using piped silt traps rather than overflow silt traps (Figure 1). Dams that dry out may need improved water harvesting, and we recommend using roaded catchments. Poorly designed and constructed roaded catchments may lead to a lot of silt movement; a silt trap may provide a short-term solution, but the roaded catchment should be reconstructed to industry standards.